This post tells you how you can open a fixed deposit or FD account online in SBI using Internet banking. Basically you need to have Internet Banking enabled on your SBI savings account to open a fixed deposit online. If you don’t have Internet Banking enabled, just go to your SBI branch and ask them for a ‘Online SBI Registration Form’. Fill the form and they will give an envelope containing your Username and Password. The interest rate given on savings account in SBI is just 4% which can’t beat rate of inflation. It means customer’s money is depreciating in savings account. In this case, FD can prove to be a better investment which gives interest in the range of 5.50% to 7.25% depending on the duration of investment. The duration of FD can be 7 days to 10 years. Recently I opened a fixed deposit or FD account online using Internet Banking. It’s a better way of escaping the crowd at the bank and wasting your time. So I opened a FD of Rs.50000 and I am going to tell you the step-by-step procedure for opening a FD online. The above picture shows the current SBI FD interest rates for different periods of time. For best interest rate i.e. 6.75%, select the duration of 1 year. If you are a senior citizen, the the best interest rate is 7.25% for a duration of 1 year. 1) Login to your Online SBI account. 2) Click on ‘e-Fixed Deposit’ tab after logging in as shown in the image. 3) Now select a type of deposit account to proceed. For normal FD account, select the first type as shown in the image. Then click on Proceed. 4) Now enter the details of the Fixed Deposit Account as shown in the image. a) Select the account from which you want to debit the amount for FD if you have more than one savings account or current account. b) Then enter the amount of the fixed deposit. In my case, it was Rs. 50000.
c) Tick the senior citizen option if your age is 60 or above otherwise just ignore. d) Now you have to select the term deposit options. 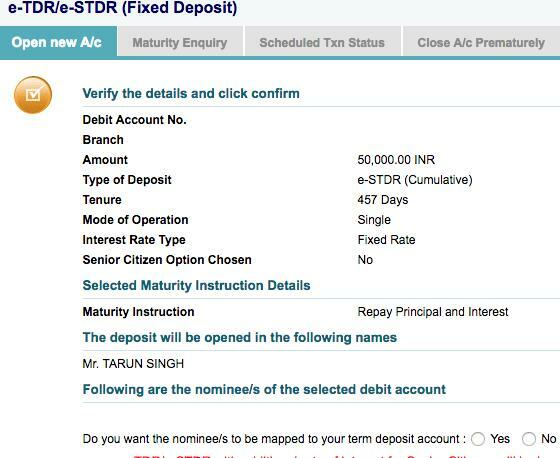 There are 2 types of term deposits in SBI: STDR and TDR. The full form of STDR is Special Term Deposit and full form of TDR is Term Deposit. Now most people get confused in STDR vs TDR. If you want the interest for your FD paid at selected intervals, choose the TDR option. If you want the interest for your FD paid at maturity, choose the STDR option. STDR is better than TDR because it gives more interest on your FD. In STDR, you get interest even on previously collected interest on FD. So I selected the STDR option for my FD. e) Now you have to select the tenure or duration of deposit. Select the duration which suits you. For maximum benefit of 7.50% interest rate, choose between 456 days and less than 3 years. I chose 457 days for my FD. f) Then you have to choose the maturity instruction for your FD. There are 3 types of maturity instructions. Let me tell you with the help of my FD. I have deposited a principal amount of Rs.50000 at an interest rate of 7.50% for a period of 457 days. The interest on my FD will be Rs.4867. 1) If I select ‘Auto renew Principal and Interest’, then Rs.54867 will be deposited again for 457 days after the maturity date. 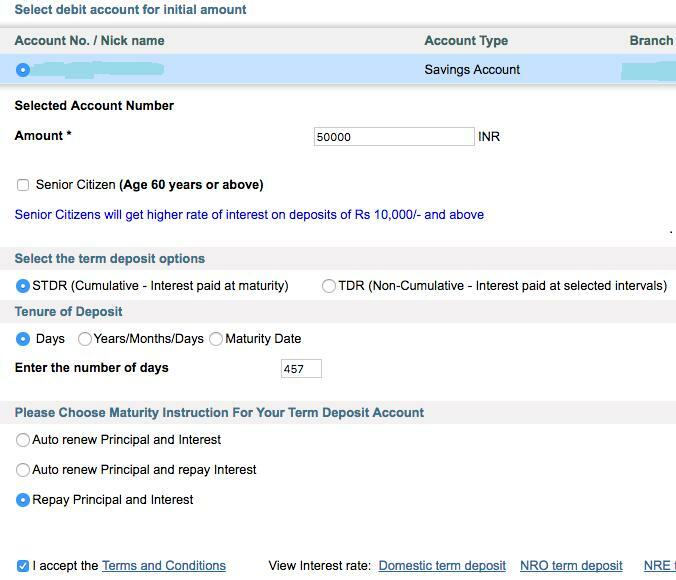 2) If I select ‘Auto renew Principal and repay Interest’, then Rs.4867 will be transferred to my savings account and Rs.50000 will be deposited again for 457 days after the maturity date. 3) If I select ‘Repay Principal and Interest’, then Rs.54867 will be transferred to my original savings account from where the money for FD was deducted. I chose the 3rd option because I wanted all the money back to the account. You can always create a new FD. Then why to auto renew the same amount. Anyways, it’s personal preference. 5) Now you need to verify the FD details and click confirm. 6) Then you will get a confirmation message as shown in the image below. Hope this article helps you in opening a fixed deposit account online using SBI Internet Banking! Thanks bro. It helps a lot. Hello Mr.Tarun you made it look easy. Thanks. Thank you very much. You've provided a very detailed information. I couldn't understand what maturity option I should select during the creation of the FD. Such a detailed explanation! Great work. Thank you so much Tarun! !